Tri-Generation - Electricity - Heat - and Refrigeration/ Absorption chillers provide an economic and environmental alternative to conventional refrigeration. Combining high efficiency, low emission power generation equipment (including solar thermal collectors) with absorption chillers allows for maximum total fuel efficiency, elimination of HCFC/CFC refrigerants and reduced overall air emissions. Combining a cogeneration plant with an absorption refrigeration system allows utilization of seasonal excess heat for cooling. The hot water from the cooling circuit of the cogeneration plant serves as drive energy for the absorption chiller. 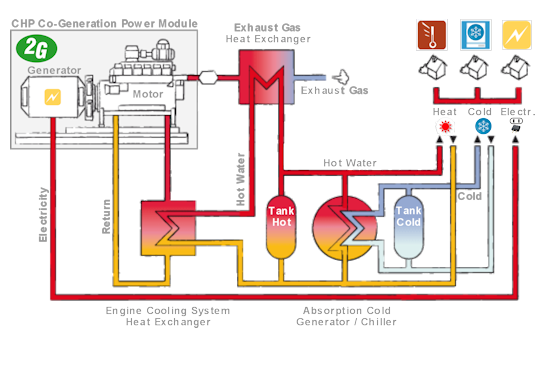 The hot exhaust gas from the gas engine can also be used as an energy source for steam generation, which can then be utilized as an energy source for a highly efficient, double-effect steam chiller. Up to 80% of the thermal output of the cogeneration plant is thereby converted to chilled water. In this way, the year-round capacity utilization and the overall efficiency of the cogeneration plant can be increased significantly. 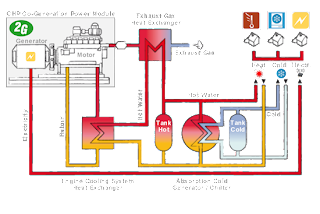 The diagram (Schematic of Tri-Generation) illustrates the simplified operation of a typical tri-generation power plant for refrigeration, electricity, and hot water. This technology utilizes waste heat through a peak load boiler to absorption and compression refrigeration equipment, while generating electricity for on-site consumption. Most recently the U.S. Government, through its Department of Energy and the National Renewable Energy Laboratory, conducted a research project to analyze current energy inefficiencies and to define effective ways to reduce energy losses. The blue graphic chart above (see Current Centralized Inefficiencies) shows the actual situation. Two-thirds of our natural resources that are burned to produce electricity (mostly coal and natural gas) are lost as heat to the environment. Today’s traditional power plants are only 33% efficient at best - some are at only 22%. Most electricity consumers are not aware about the fact that the generation and distribution of electricity through the national grid is notoriously inefficient. Conventional power plants emit the heat created as a by-product of electricity generation into the environment through cooling towers, flue gas, or by other means. Also in most engines and standard diesel & gas generator sets, more than half of the available energy is lost as excess heat. Already in 1978, the U.S. Congress recognized that efficiency at central power plants had stagnated and sought to encourage improved efficiency with the Public Utility Regulatory Policies Act (PURPA), which encouraged utilities to buy power from decentralized and private energy producers. However, the bill left implementation and enforcement up to individual States, resulting in little or nothing being done in many parts of the country. Relatively low prices for raw materials like coal, fossil fuel, and natural gas created further complacency. CHP - Cogeneration and Distributed Generation Today the situation is different. Prices for coal, fossil fuel, and natural gas are increasing. 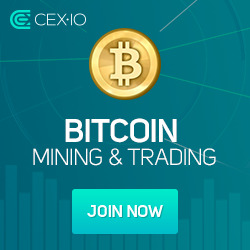 Due to the fact that coal and crude oil is in high demand, especially in emerging economies, and because the world has reached its peak in oil production, traditional energy resources are getting scarce and prices are expected to increase to extreme high levels never seen before. Carbon Dioxide emissions are leading to global warming and the vast majority of all leading scientists worldwide are in agreement that CO2 release into the atmosphere must be significantly reduced. Already during the 90’s Europe has actively incorporated renewable energy sources and CHP co-and tri-generation into its energy policy. Most recently the US Government followed this trend and today all agencies like the Department of Energy, the EPA, and most State Energy Authorities are actively supporting decentralized power generation policies (distributed generation), especially CHP (combined heat & power) co-and tri-generation, and the effective utilization of new renewable energy technologies. Combined with new renewable energy technologies (see Proposed Decentralised Efficiency ) this will lead to significant improvements. Tri-generation is a thermodynamically efficient use of fuel. In separate production of electricity some energy must be rejected as waste heat, but in cogeneration this thermal energy is put to good use. New CHP technologies are available to greatly increase power generation efficiency technologies.